For some reason we have less success cooking fish than anything other protein. Shellfish, we are usually cool with but fish, especially salmon, we have a hard time getting to look like the photos from cooking sites. Tonight’s salmon is slightly over cooked and oozing out so much of that white stuff that we mostly hide it under the parsley/caper/scallion sauce. Part of our problem is timing. John is cooking the fish while I am cooking the rice and broccoli plus making the sauce. I get the brilliant idea (to me) of putting the broccoli on top of the rice for the last ten minutes to steam it so we will not have to dirty another pot. So I manage to throw off the cooking time of the rice which leaves the salmon oozing in its pan too long. The dinner is mostly saved by the tasty parsley sauce. Daughter walks in as we are finishing dinner and I say, have the rest of the rice if you want it. She takes the rice, adds the uncrispy fish skin, tops this concoction with an over-easy egg, and goes off yumming happily. So there is a silver lining to our fish story tonight. 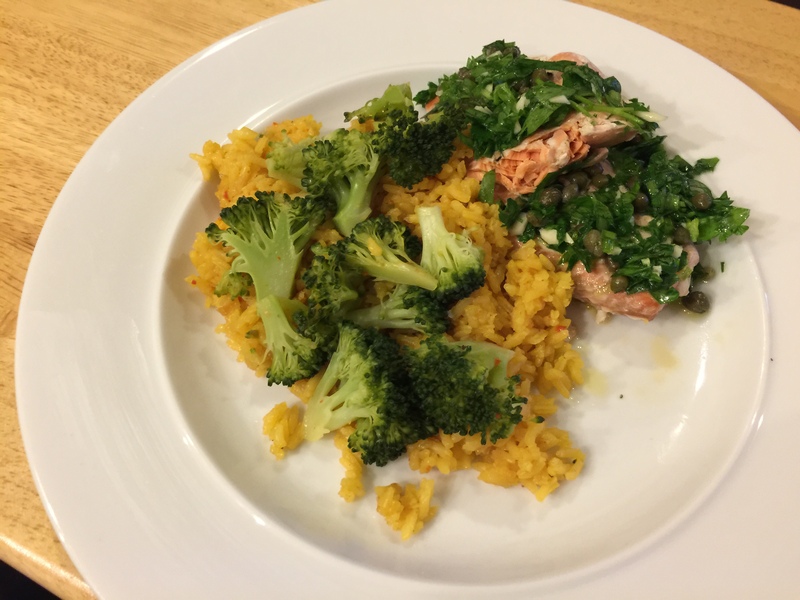 This entry was posted in American, Fish, pescatarian, rice, Vegetables and tagged broccoli, Pescatarian, salmon, yellow rice. Bookmark the permalink.